The sheriff said people should be familiar with IRS protocols ahead of time so they don't fall victim to the many scams that tend to pop up around this time of year. 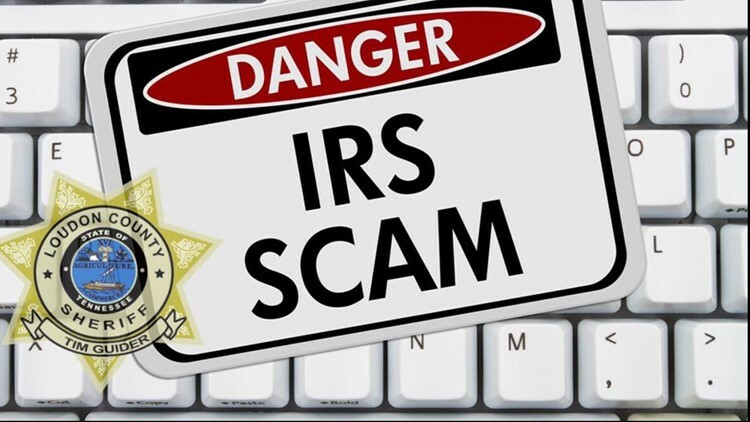 LOUDON COUNTY, Tenn. — The Loudon County sheriff is warning residents to be on the watch for potential IRS scams ahead of tax season. The sheriff said the scams are usually done over phone and email and are related to tax returns and tax collections -- preying on people who aren't aware of IRS protocols. “It’s important to us that we help educate our residents, ahead of time, so that they are familiar with the protocols the IRS has in place for dealing with your returns and any collections you may have due," Sheriff Tim Guider said. The LCSO said it's important for people to realize that the IRS doesn't typically call you by phone and never accepts payment through pre-paid gift and debit cards. Instead, the sheriff said the IRS initiates most contact through regular postal mail. Occasionally, the IRS will call or come to a home or business when the taxpayer has an overdue bill, or tour a business as part of an audit. Even then, the IRS will still send several notices through the mail. The LCSO said the IRS will never demand that you pay taxes without the opportunity to question or appeal the amount you owe, nor will they threaten to bring in local police, immigration officers or other law enforcement to have you arrested for not paying. The IRS cannot revoke your driver's license, business licences, or immigration status. The LCSO said threats like these are a tactic scam artists use to trick victims into buying into their scheme. Instead, the IRS will provide specific guidelines on how to make a tax payment to the U.S. Treasury through the official IRS website. If they pay a visit, they will always provide two forms of official credentials call a 'pocket commission' and a HSPD-12 card. If you think you've fallen victim to a tax scam, the IRS offers resources on scam reporting through their website. For more information on tax scams, or to report suspicious scam-type activity if you're a Loudon County resident, you can contact the Loudon County Central Dispatch’s non-emergency number at (865) 458-9081 and request to speak to a Deputy.